Please refer to our stock # 1876 when inquiring. SOLD SEPARATELY FOR $3,000: Two Early Ming dynasty Pottery Glazed Equestrian, Horse and Riders, China (1368 - 1644 C.E.) 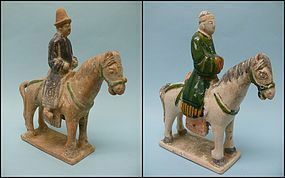 beautiful sancai glazed equestrians with attached heads, various personalities, all in good condition with some age wear. Loss of left foot on red rider, and loss of horses ear on green rider. Both approximately 9 1/2" high. The early Ming dynasty was a period of cultural restoration and expansion. The reestablishment of an indigenous Chinese ruling house led to the imposition of court-dictated styles in the arts. Painters recruited by the Ming court were instructed to return to didactic and realistic representation, in emulation of the styles of the earlier Southern Song (1127–1279) Imperial Painting Academy. Large-scale landscapes, flower-and-bird compositions, and figural narratives were particularly favored as images that would glorify the new dynasty and convey its benevolence, virtue, and majesty. Early Ming decorative arts inherited the richly eclectic legacy of the Mongol Yuan dynasty, which included both regional Chinese traditions and foreign influences. For example, the fourteenth-century development of blue-and-white ware and cloisonné; enamelware arose, at least in part, in response to lively trade with the Islamic world, and many Ming examples continued to reflect strong West Asian influences. A special court-based Bureau of Design ensured that a uniform standard of decoration was established for imperial production in ceramics, textiles, metalwork, and lacquer.